What happens when you put the two highly rated characters in one frame, pure chaos as they will tend to show who is the bigger boss in the this epic battle to the death, well sort of. Sadako, the long haired demon, is reborn in the never ending tale that encompass the mysterious videotape. You know the drill, once the video is played, it is followed by a ringing tone. The unlucky victim dies two days later. 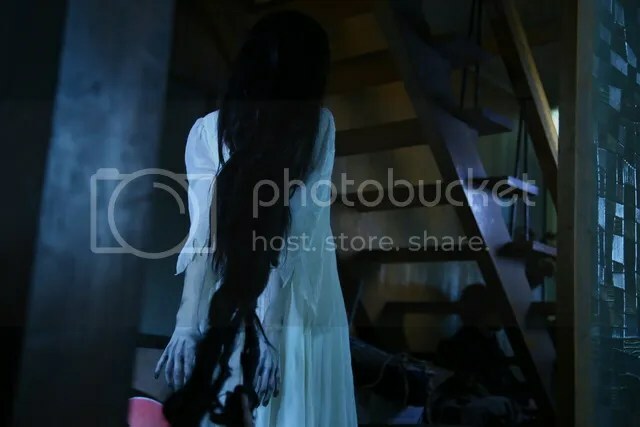 On the other hand, Kayako together with her dead child, Toshio traps victims in their house where they were originally killed. The chain of events was triggered by the curiosity of a university undergrad, Yuri with regards to the cursed videotape. A high school student, Suzuka who suffers from nightmares of the nearby haunted house. The two girls were helped by a psychic, Keizo who initiated the plan to intertwine the two curses together in order to end it. This led to a disastrous blood sheds and thrilling build up to the epic battle between Sadako and Kayako. Expect to see long strands of hair appearing out of the blue and a kickass demon crawling constantly towards the screen.You have been warned. If you a fan of the Ju-on horror series and The Ring, you should catch this movie which is now in theaters. In my opinion, this movie is for the die hard fans of the Japanese horror trilogy as it stays faithful to the original plot. It does has various spine chilling scenes and those high screeching noises will make you wanna cover your eyes uncontrollably.You might want to pick a side after watching the epic battle.